Undaunted by a watershed week in world politics, the Grosvenor November auctions defied negative predictions by accumulating an impressive total result of £821,036 which included many very strong realisations. The November 8th Specialised Great Britain auction was strong in rarities from the present Queen’s reign, including the fine Roy Webster collection of decimal booklets, which received a strong response from fellow collectors of this intensely specialised area. Featured on the front cover of the auction catalogue, the beautiful 1997 Flowers booklet with gold (Queen’s head and value), phosphor and blue-green (from the labels) printings all omitted (lot 960) achieved a fine price of £12,280. The 1964 Forth Road Bridge 6d. 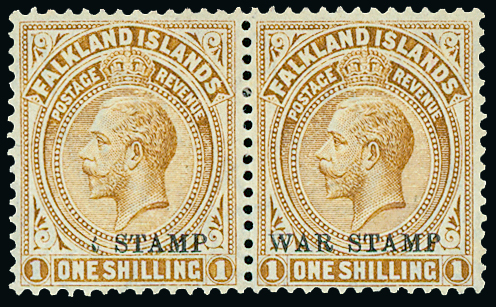 showing the light blue omitted variety, contained in a strip of eight with two adjoining stamps also partially affected (lot 806), achieved £3,070. The Surface Printed section of the sale contained an exceptionally fine used example of the 1862–64 watermark emblems 9d. straw plate 2 TF watermark error (lot 427, above) that reached £3,193 whilst amongst an attractive presentation of Seahorses, the set fine imprimatur corner blocks of four taken from the registration sheets of the 1918 Bradbury Wilkinson high values (lot 632) achieved £9,824. The November 9th British Empire & Foreign Countries auction featured a further instalment in Grosvenor’s unparalleled series of offerings of Falkland Islands & Antarctica, including exceptional material from the collections of Hugh Osborne, Ralph Riddell-Carre and Derek Harwood. The section began with a new discovery, a letter sent from the islands by Captain Thomas Trott of the American schooner “Sun” just after the assertion of British control in 1833 and containing fascinating comments on current events and his encounter with Captain FitzRoy whose ship, the “Beagle” was carrying naturalist Charles Darwin. This fascinating item (lot 1496) fully deserved its realisation of £7,140. As expected a number of exceptional landmark prices were achieved on the day, including the £6,902 paid for the appealing imprint block of four of the 5s. 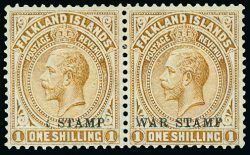 Sea Lion from the 1938 printing (lot 1603), £6,188 successfully bid for the rare horizontal pair of the 1918-29 WAR STAMP 1s. 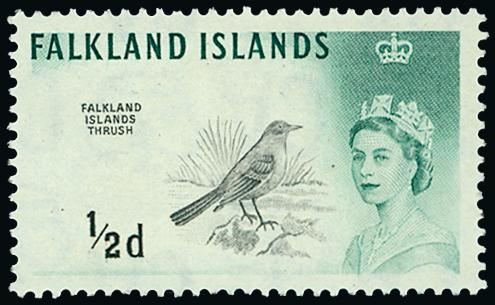 showing overprint partially omitted on one and full albino impression on reverse (lot 1551, left), as well as the £7,638 required to purchase the only known unused example for the 1960-66 Birds 1/2d. 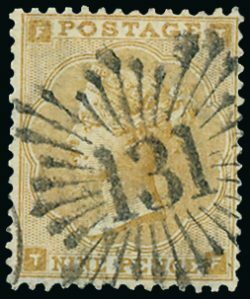 watermark inverted variety (lot 1646, above). Notable prices elsewhere in the sale included the fine price of £2,272 reached for a scarce double rate cover from the well known correspondence of letters sent from Saint Vincent to the Duc de Polignac in France (lot 1403), whilst the handsome printer’s trial proof of the unissued 1935 50s., a major Zanzibar rarity (lot 1495) reached £2,142. Once again the stamp market has failed to panic at a time of worldwide financial uncertainty and continued to confound analyses which have suggested that a shrinking base of collectors will lead inevitably one day to a downward tumble in prices. Any such judgement day, when at the sound of the last trump all will change, seems still very far away. Full listings of prices realised at each auction may be downloaded from the Grosvenor website. Contact Andrew Williams or Tom Margalski at Grosvenor for further information.